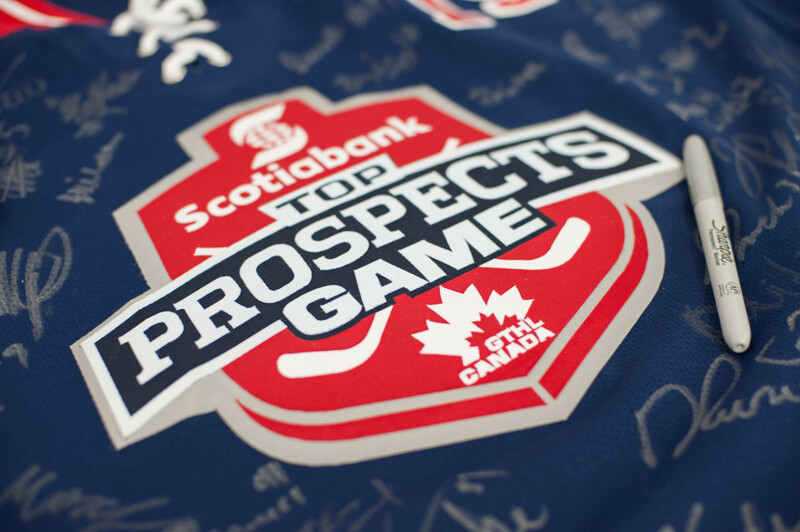 The Greater Toronto Hockey League (GTHL) today announced the 42 players selected to participate in the 7th Annual Scotiabank GTHL Top Prospects Game. The rising young stars will compete on two teams led by NHL alumni Adam Graves (Team Graves) and Shayne Corson (Team Corson). Each roster features two goaltenders, six defencemen and 13 forwards. Nine different Minor Midget AAA clubs are represented at the event, with the League-leading Toronto Marlboros pacing all clubs with eight players on Team Graves. The Toronto Red Wings and Mississauga Rebels will both send seven players to the event. Six members of the Toronto Jr. Canadiens will suit up in the showcase, including captain Ryan Merkley, who will play in his second GTHL Top Prospects Game. Only one other player has made multiple appearances at the event – former Don Mills Flyers goaltender Jack Lafontaine, who played in 2012-13 and won MVP for Team Graves in 2013-14. The Flyers will have four players at this year’s event, while the Vaughan Kings, Mississauga Senators and Toronto Titans each will have three players. Forward Liam Foudy of the Markham Majors rounds out the group of 42. Brothers Wayne and Keith Primeau will join their fellow NHL alumni as assistant coaches for Team Graves and Team Corson, respectively. In addition, the head coach and trainer from the Marlboros and Red Wings – the League’s top two teams – will join each respective coaching staff. Each team will practice on Monday, Dec. 14, 2015 at Scotiabank Pond – Team Corson at 7:00 p.m. and Team Graves at 8:30 p.m. The game will take place on Tuesday, Dec. 15, 2015 at 7:30 p.m. at Scotiabank Pond; warm-up begins at 7:00 p.m. Rogers TV cable 10/63 in Toronto will air the game on Sunday, Dec. 20, 2015 at 8:00 p.m.
Advance tickets are available online or at the GTHL office (57 Carl Hall Road, Toronto, ON, M3K 2B6) from Monday to Friday from 9:00 a.m. to 5:00 p.m. or on Saturday from 9:00 a.m. to noon. Tickets are $8 in advance or $10 at the gate. No passes will be accepted.